The Preston Motors showroom was the scene for the cheque presentation from the proceeds of the Run For Strength Fun Run. Staff and media played witness to organisers and sponsors running to deliver the cheque to a waiting MD ED. “The MDA appreciates the tremendous support of organisers and sponsors for this remarkable result” said Boris M Struk. 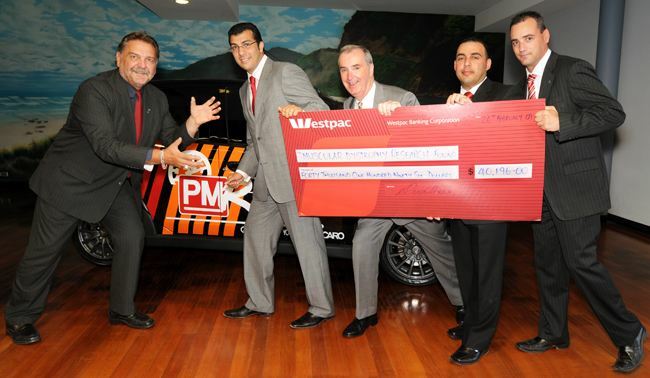 Boris M Struk waiting for the cheque delivery by: Anthony Yanko, Director (YPA Estate Agents), John Bradley, Managing Director, Preston Motors, Ozi Akyildiz and Sam Quattrone, Run For Strength organisers.